This is an interesting chart. 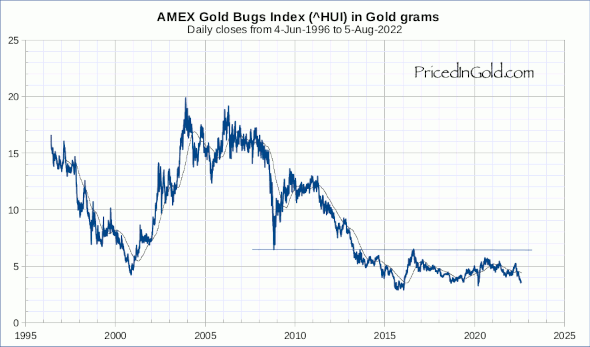 It seems to indicate that it might be a good idea to sell gold and buy the HUI index and hold it at least until it reverts to it's mean of around 10-11 grams, doesn't it? It would be good to have data going further back, are there any plans for that? Hi Niklas, I think this is a good time to be buying select gold stocks, if you have an investment horizon of several years. There could be further weakness, possibly all the way down to the red line support at 4.2 g. EIther use trailing stops (in gold) to get you out if the market heads lower, or average in on the way down. Because gold stocks are leveraged to gold, it is important to pay attention to position sizes – don’t go “all in”. Over the next 5-10 years, the chances are very good that you will be richly rewarded. wondering if you will be adding a screener showing the cheapest assets historically vs gold? this would be interesting to monitor. Hi JC, I am currently developing an investor’s toolkit that will include screeners, but this isn’t ready for prime time yet. i’ll let you know when it’s ready to test drive. 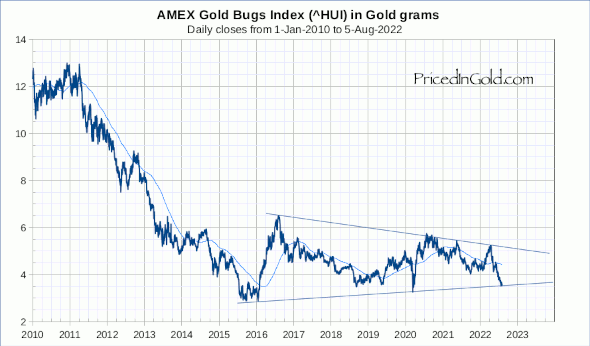 You would be a great benefit if you could provide the Barrons Gold Mining index priced in gold. This gold mining index started 1940ish and would be facinating to see. I've been following anything related to gold and I have not seen this done before but I can guarantee would be of great interest. I have had several requests for this index, and with the kind permission of Nick Laird of ShareLynx.com, I have added it to the site here. I think it is significant that the index currently sits very close to its all-time lows, about where it was in 1942. Your charts are beginning to look different! Especially the Dollar, S&P500, Dow and Gold Stocks. Thank you for taking the time to keep them updated. I love your site! I'm on it all of the time. Any thought of doing a Ether chart? I'd be happy to do an ether chart if I can find a source for a downloadable price history. Do you have a link for me? Is it possible to get longer comparison data, back to 1980? No, the HUI Index was created in 1996. No data is available before that date. Take a look at the BGMI (Barron's Gold Mining Index) instead. Gold Mines relative to Gold were at an All Time Low in January 2016.